you meet someone and you are so glad that you did. It was Convention last year (Denver) and I happened to spark up a conversation with someone. She was so enthusiastic. She encouraged me to “get out there and share” what it is I do. She wants my SU! business to grow. Her motivation is contagious. Guess who? I’m referring to Kimberly Van Diepen. Isn’t she awesome? Let me tell ya, when you communicate with her, you will feel like you have known her for years. I receive emails daily with business tips and such. I never have that “blah, blah, blah…too many emails…delete” syndrome when it comes to her emails. Now to show my appreciation for those who stop by my site….How about a tutorial? I have read that many wish Stampin’ Up! would share dimensions and directions. 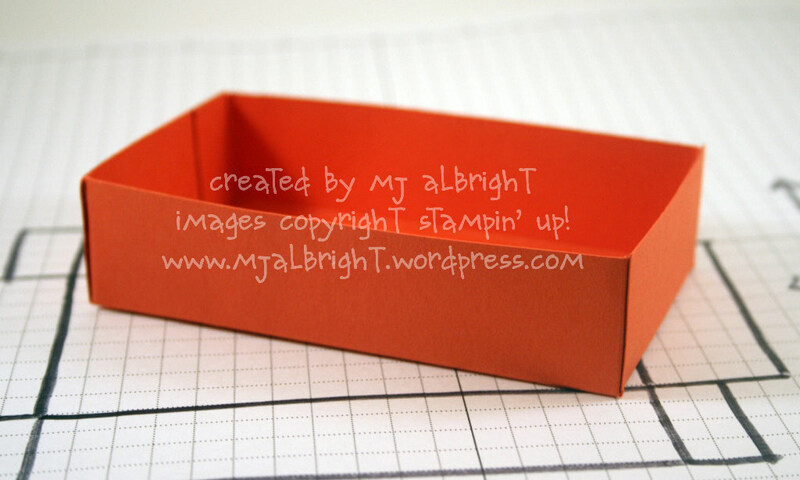 With this VERY SIMPLE & BASIC BOX TUTORIAL, YOU WILL BE ABLE TO CREATE A BOX FOR YOUR FUTURE PROJECTS. I made 10 cards that will hold your personal business card. Old Olive cardstock cardbase measures 3-3/4″ x 4-1/2″ folded in half. 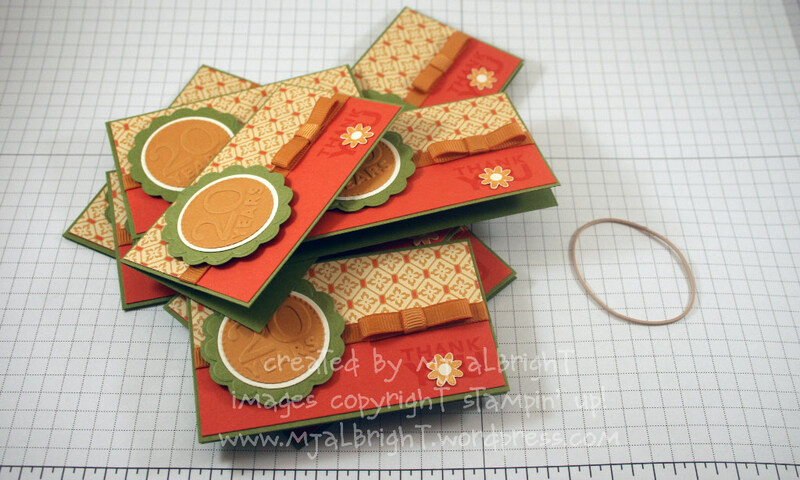 Next layer is Tangerine Tango measuring 2-1/8″ x 3-5/8″. Haiku DSP strip measures 1-1/16 x 3-5/8″. 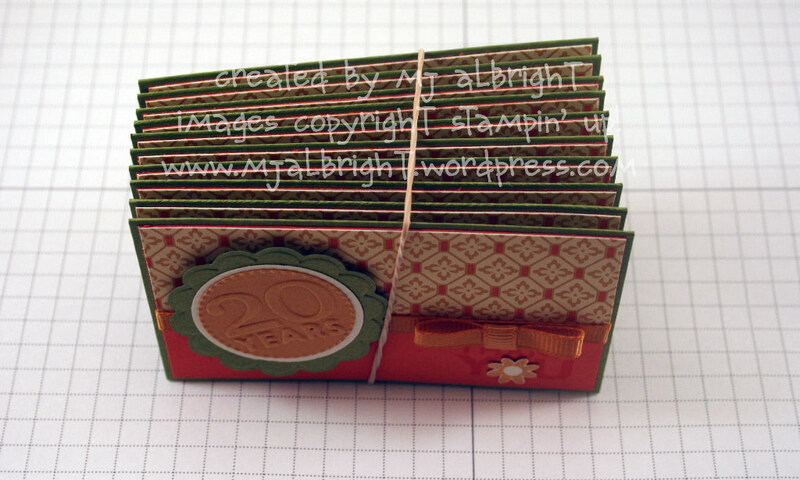 Place a rubber band around cards on top of Grid Paper. Draw a box around the base for the bottom of the box. Determine how high you want the sides of your box. For mine, it’s only 1″ (very tiny box for displaying purposes and easy for people to grab a card with your information inside). 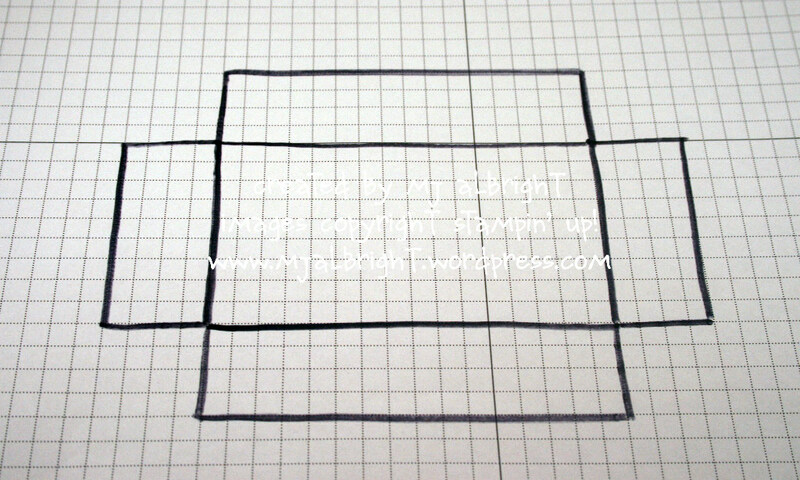 Draw out 1″ to all four sides. You need to add a “tab” for holding box together. Mine is 1/2″ to the long sides. 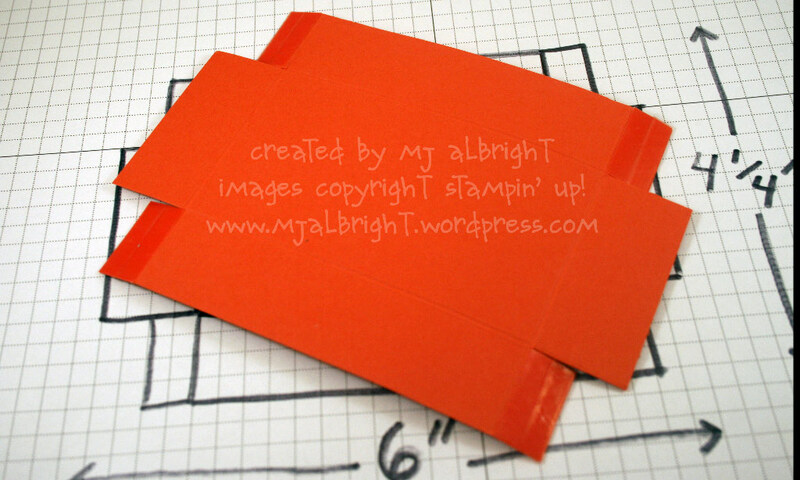 You can see the final dimension and now you can take your cardstock and cut it to this size. This is what your cut cardstock should look like. Apply Sticky Strip to the four tabs. The tabs are to be adhered to the “inside” of the smaller side pieces. Embellish to your likings. I simply placed 5/8″ Old Olive Grosgrain around mine and made a bow. Very easy. The mini cards are the time-consuming part of the project. ACCESSORIES: SU! 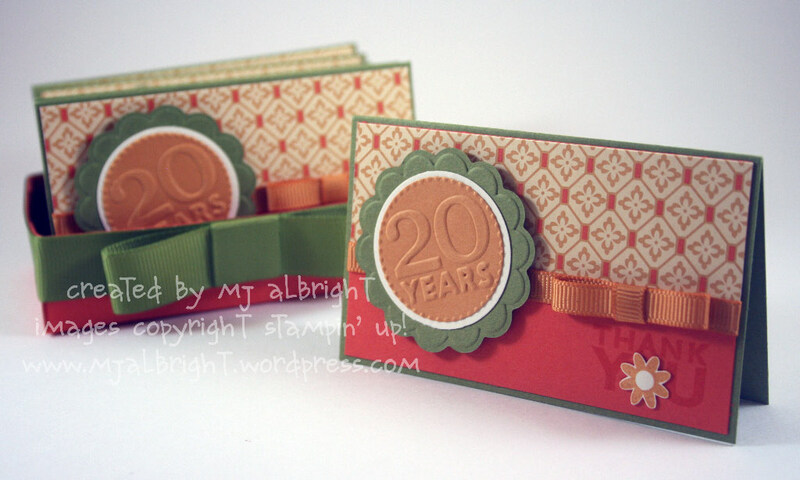 Sizzix Side Kick; 20 Anniversary Die; Mustard and Old Olive Grosgrain Ribbon; Stampin’ Dimensionals; Mini Glue Dots; Sticky Strip; 1-1/4″ & 1-3/8″ Circle Punches; Grid Paper. I want to know how you embossed the circles. These would be so cute for baby showers or sweet 16-just gotta know the deets on the circle. Your projects are gorgeous and you inspire us all. WOW! THANK YOU SOOOOO MUCH for the directions. This is a beautiful gift & presentation. I’m one of the many who wish SU would give dimensions. We are the buying public yet they seem to have problems with sharing how to make items in all the catty’s we order from. Thank God for all you Blog people. You are awesome for posting all your beautiful creations using SU & all the other’s products. I apprecite you!! TAFS! Great tutorial! I just love your cards and box. The colors are so pretty together and just love the style of your cards. YOU ROCK! Thanks so much for the tutorial on the box. I saw your project on the SU website. Congratulations! Awesome box and cards. Thank you for sharing. Love your blog, too. Wow…these are fantastic, Mary Jo!! You so rock!!! Wow, great little package! I love the embossed circle! Thanks for the directions. Thanks so much for sharing! I love visiting your blog and seeing what you’ve created. You are an inspiration, yourself, to so many! Thanks again, the box is beautiful! That’s a great gift, and that’s very nice of you to send it to her. 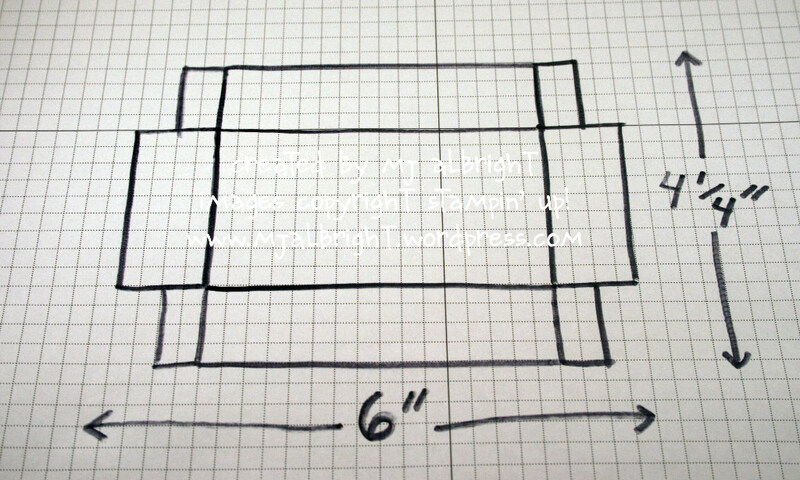 Thanks for sharing how you figure out box dimensions – I’m going to keep that in mind! Thanks for doing this. Guess my email wasn’t the only one!! Awesome, awesome awesome! This is fabulous Mary Jo! Thanks so much, this is a GREAT project!!! My only question is HOW did you make the bows? I JUST HAD A LIGHTBULB MOMENT! WITH YOUR ASSISTANCE, OF COURSE. I HAVE SHIED AWAY FROM MAKING MY OWN 3-D CONTAINERS. PLACE THE ITEMS ON GRID PAPER AND MEASURE IT OUT IN EASY INCREMENTS – DUH! I WAS OVERTHINKING ALL THIS TIME. THANK YOU SO MUCH FOR SHARING THE TIP! 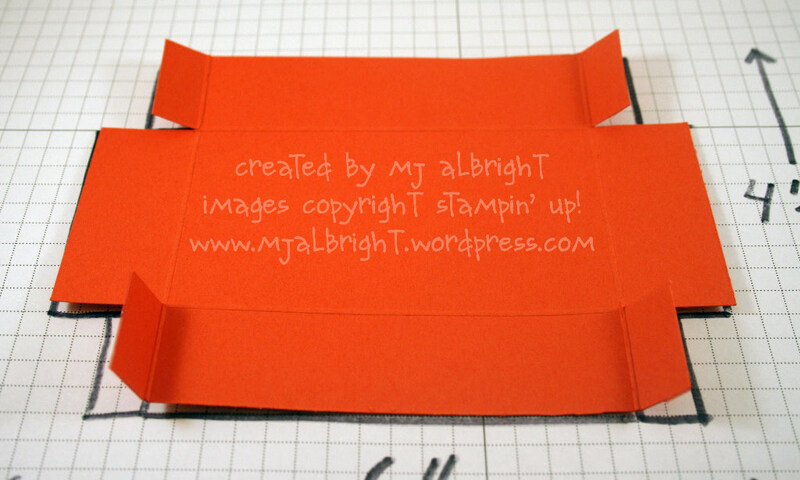 Thank you so much for sharing how to create a box…. I always wondered how it was done. You make it seems so simple. Thanks for the wonderful inspiration you give too! Great tutorial and love how you drew it out on the grid paper…I do this quite often. Thank you so much for your sharing this tutorial with us. When I saw it on SU!, I knew that I had to make this and was disappointed that they weren’t sharing the measurments with us. I love how you did the scallops, how did you make them?? 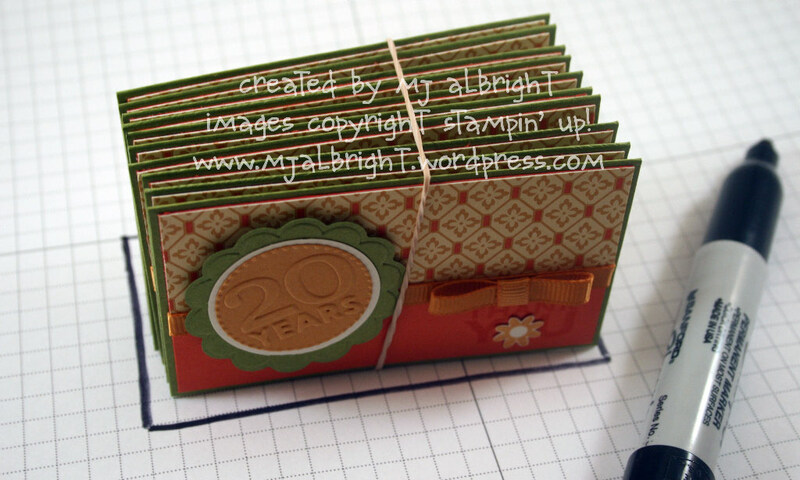 Thank you for taking the time to share you love of stamping with us, we really appreciate. I check out your blog daily and love your work. I look forward to learning from you as a fellow demonstrator. Btw, I wholeheartedly agree that KVD is the most awesomest (is that a word? it is now.) motivator of a demo that I’ve ever met! I wanna be you when I grow up. Ok. You’re probably younger than I am, but you get the picture. Thanks so much for these dimensions/directions!! Maybe you can convince SU! to include these in future months. And congrats on the well-deserved Artisan Award!! So cool MJ! Love what you did here and thanks for explaining how to figure out a box! I’d never thought to use the grid paper like that before! yah! This is darling!! What an awesome tutorial!! Love the holder!! Absolutely Awesome! Thank you so much for sharing! You are a blessing to all of us! Thanks for showing how to make the box! These directions are soooooo easy to follow and modify! It is this week’s featured 3D Demo Challenge over @ SCS! Thanks for the inspiration and tutorial!